The deserts of north Africa were an important battleground in World War II. Controlling north Africa would give the Allied forces a base from which to attack occupied Europe, across the Mediterranean. There were also major oil fields in the Middle East that were vital to fuel their tanks, planes and motorised transport. Control of oil supplies was often a deciding factor in winning battles. Some Italian forces were present in this campaign, but it was the German forces under Field Marshall Erwin Rommel that played the greatest part. Rommel was recognised by his enemies as a brilliant tactician; and at first, his troops were unstoppable. He used panzer (‘armour’) tanks to make swift attacks across the flat desert terrain, driving most of the Allied forces out of Libya, into Egypt. A number of British and Commonwealth troops remained in Libya, in the fortified port of Tobruk. Rommel’s forces surrounded the port in early April 1941, and so began the siege of Tobruk. Good Friday. Continuous air raids all day. Very heavy artillery barrage all afternoon. Tank battle four miles south. Saw our tanks on fire […] We are now surrounded. The Nazis used people from English-speaking backgrounds to broadcast propaganda intended to demoralize and undermine the soldiers and citizens of Allied nations. One of these was William Joyce, who had been born in America and grew up in Ireland. Because he spoke with an upper-class English accent, he was nicknamed 'Lord Haw-Haw'. After the war he was tried for treason and hanged. Tobruk is the most important port in northern Africa, because its deep water allows large ships to dock there. It is also surrounded by steep escarpments, which make it easy to fortify against attack from the land. 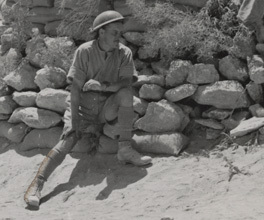 There were some 14,000 Australian troops and 12,000 British and Indian troops in Tobruk during the siege. Although the Germans dominated the desert, the British Navy still controlled the waters around the port, so they were able to supply provisions to the men holding Tobruk. Allied forces endured air raids and artillery attacks during the day. At night, they moved out from behind their defences to conduct raids against German positions, often crawling for miles to attack in silence. During the siege, some 3,000 Australian troops were killed or injured. On 11 April, Rommel attacked Tobruk with tanks and foot soldiers, but the defenders were able to turn him back. This was the first time anyone had been able to stop the German forces in the north African campaign. Nazi propaganda radio broadcasts spoke contemptuously of the Tobruk defenders as ‘rats’. In defiance, the soldiers proudly adopted this nickname and have been known by it ever since. During the siege, they designed their own medals, in the shape of a rat, made from the scrap metal of a downed German aeroplane. Rommel kept up the bombardment until November 1941, when a counter-attack by the British re-took the territory, and the siege was ended. Tobruk was a great boost to the morale of the Allied forces: the seemingly invincible Germans had finally been turned back. The end of the war brought dancing in the streets, but years of hardship still lay ahead. Major Arthur Moon saved lives in the Japanese prison camps, and kept a secret record of his work. A hard fought battle along a narrow jungle track created a legend in Australian history.